Buildings "grown" from fungus and other organic materials may seem like a far-off concept to some. But this summer, a group of young Brooklyn architects are planning to demonstrate just how real the technology is—by building a tower out of bricks "grown" from mycelium in the courtyard of MoMA P.S.1. The curators at MoMA P.S.1 have announced that they've chosen the Brooklyn firm The Living to design the outdoor pavilion that sits in their courtyard every summer. The Living's plan is to build a series of towers using bricks grown from farming refuse and mycelium. At the end of the summer, the structure will be torn down and composted. If you're utterly confused, here's the backstory. Evocative is a young, upstate New York company that has pioneered the use of mycelium—the stringy part of a fungus that grows incredibly quickly, forming around whatever space it has to grow. Evocative uses the stuff to create completely compostable packaging, insulation, and a host of other products (you can read our coverage of the company here). But thus far, Ecovative's rather amazing process hasn't been harnessed by many architects. That's set to change within a few months. 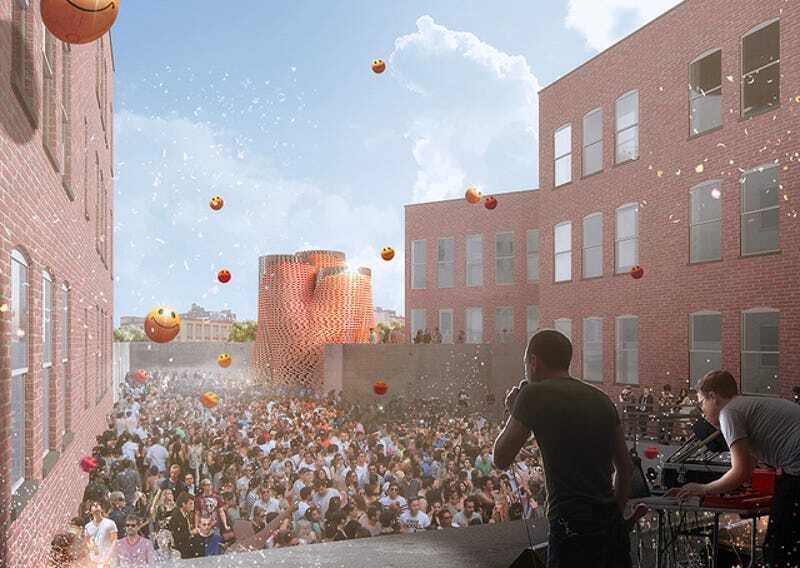 The Living's design, Hy-fi, proposes a sinuous set of cooling towers—after all, the space is meant to cool down party-goers at P.S.1's summer events—that are built out of two sets of bricks. At the top, reflective bricks made from a new daylighting mirror film invented by 3M—intended to draw hot air up through the tower. But the lower sections will be built with 100 percent organic bricks, grown using Ecovative's mycelium process. Each brick will be formed by putting refuse from farms—corn stocks and the like—into a brick mold, then letting the fungus loose inside to do its thing. Within a few days, presto—a completely compostable building material.